Chinese consumers bought a third of the world's luxury goods, and global sales rose 20 percent in 2018, according to a China luxury market study report released by Bain & Company on Tuesday. "The average age of luxury consumers in China is lower than those in other parts of the world. The millennial generation is still the main driving force for the development of China's luxury market," Bruno Lannes, the global partner of Bain & Company, told thepaper.cn on Wednesday. Luxury brands are targeting the millennial consumer class by constantly reinventing their products to attract purchases, according to the report. 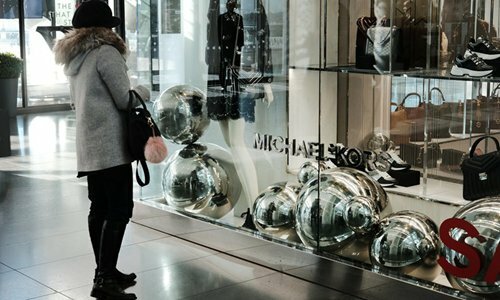 More Chinese consumers choose to buy luxury goods in the domestic market, due to the reduction of import tariffs, and adjustment of domestic and foreign market price gaps. Chinese people's consumption of luxury goods in the Chinese mainland occupies 27 percent of the total amount of their luxury consumption in 2018, increasing from 2015's 23 percent, and the number is expected to reach 50 percent by 2025, according to the report. The report also pointed out that it doesn't mean that Chinese people will spend less in the overseas market. Chinese people's consumption of luxury goods occupies 33 percent of the global luxury goods market, an increase of 1 percentage point from 2017. Additionally, online luxury sales also saw an increase of 27 percent in 2018. By 2027, China's middle class will be even larger, accounting for about 65 percent of all households, according to Bain & Company. The per capita income of China's urban population is rising, boosting the luxury goods market.